Great beers, great food and a great atmosphere. 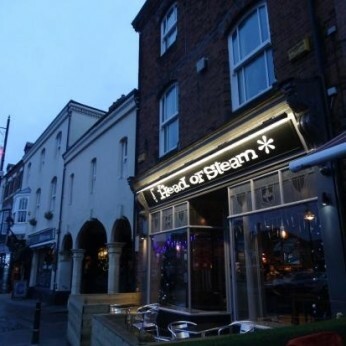 Located in the popular coastal resort of Tynemouth, The Head of Steam opened its doors to the public in May 2014. Previously known as 'Aspire' the sites refurbishment and rebranding complete with a new diverse 200+ range of lagers, beers, ciders, wines and spirits mean this happening drink spot has proved a popular hangout and staple on the Tynemouth circuit. Featuring beers from Munich, tasty food specials, plus Oktoberfest guest beers too! Pick up a collector's card at the bar and receive a FREE stein with 6 pints of Paulaner! Designated Drivers - A Drink on Us! Calling all designated drivers: Have a drink on us this Christmas! Just show your car key at the bar to claim your free Budweiser Budvar B:FREE or Pepsi/Diet Pepsi/Pepsi Max. Available from 1st December - 31st December 2017. Across all Head of Steam venues!